The Strait of Juan de Fuca experiences a large volume of continuous ship traffic. Large cargo and tanker ships must go in and out of the Strait in order to get to the Port of Seattle and to the Port of Tacoma, two of the busiest ports in the country, as well as Port Metro Vancouver, Canada’s largest and busiest port. These ships burn fuel and emit compounds that affect human health and play a significant role in tropospheric chemistry and the formation of ozone. 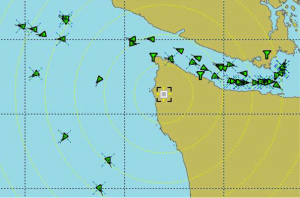 Utilizing AIS (Automatic Identification System) technology, we can monitor and quantify ship traffic through the Strait of Juan de Fuca. As of 2004, the IMO (International Maritime Organization) requires all vessels over 299GT to carry an active AIS transponder on board. The AIS transponder reports dynamic data such as position and speed as well as static information like cargo and dimensions. Such data from AIS allows us to examine correlations in the ship traffic with measurements of important emissions that ships contribute to such as SO2, NOx, and particle number concentration. By examining these correlations, the goal is to quantify the impact ship traffic has on pollutants observed in the Strait of Juan de Fuca area, and whether that impact has a significant pattern.